Plans to turn around the Minnesota Twins rotation took a hit today with the news that Trevor May, a big factor in those designs, has suffered a tear to the ulnar collateral ligament in his right elbow. Read on for details and quotes regarding the right-hander’s very unexpected setback. In a decade of playing professional ball, May has amazingly been able to avoid any kind of significant elbow or shoulder issues. “I’ve literally never missed a day of baseball activity because my arm hurt,” he said. So it isn’t too surprising that when he felt a “grab” on an 0-2 pitch against Andrew McCutchen while facing Team USA on Wednesday night, he downplayed it. When speaking to reporters after the game, he was very positive, signaling no distress or concern. 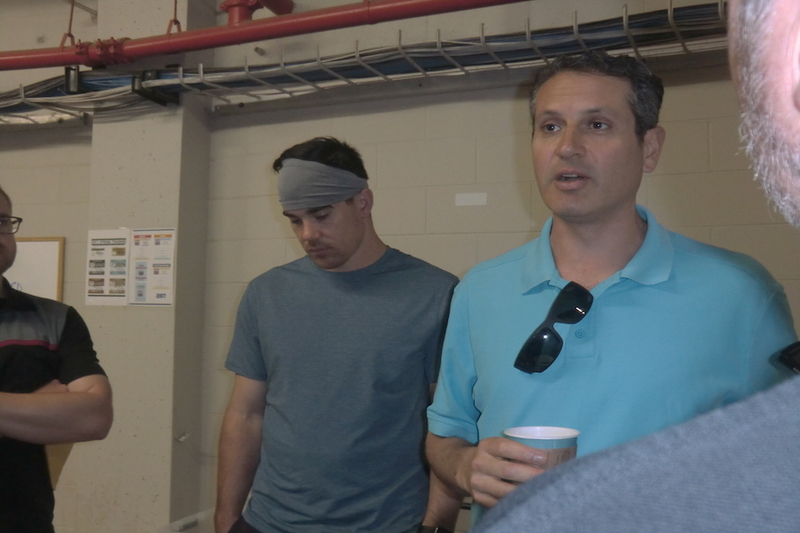 Standing outside the clubhouse on Saturday morning alongside top baseball executives Derek Falvey and Thad Levine, May was subdued but searching for silver linings. So, too, was the general manager. “That gives us cause for optimism that maybe the health of the overall region is very strong but for this one acute area." Of course, this doesn’t change the basic realities. May will seek a second opinion – no date or doctor has been scheduled as of yet – and there are a few potential options on the table, but Tommy John surgery seems likely. Levine expressed no plans for reactive moves by the team, noting that injuries are always an expectation. Among those guys are Tyler Duffey, Jose Berrios, Adalberto Mejia, Rule 5 pick Justin Haley and non-roster invite Ryan Vogelsong. Duffey pitched well in a road start for the Twins against Miami on Friday and Berrios is preparing to make his first start for Puerto Rico in the World Baseball Classic. For May, who was the subject of a feature here on Twins Daily just a couple days ago, it’s a difficult pill to swallow but he vows not to let it derail his determination. Who's everyone got for the fifth starter now? This one hurts. I was really hoping May could take off in the rotation, leading to a trade of one (or more) of Gibson, Santiago or Hughes to make way for the higher-upside arms (Gonsalves, Berrios & Mejia). I'm afraid that this setback will now keep those three on the mound (barring health issues with one or more of them) all season. First Kirillof, then Gonsalves (still hoping for him), now the coup de grâce. Goodness gracious what the hell did the Twins do that upset the baseball gods so? Well, in a word, crap. Wish Trevor the best, and hope he does the TJ surgery right away, so he can be back sometime next year. This is why no never have enough pitching. "The beatings will continue until morale improves" does not even begin to express my disappointment for this injury. I feel so bad for Trevor May. He has worked so very hard. This is a major disappointment for him. Hopefully he can get the tear repaired andremain positive about this difficult situation. All of us at Twins Daily are pulling for you, Trevor. As former NC State basketball coach, Coach Jimmy Valvano, said: "Never give up...never, never give up." I'm not equating cancer with a torn ligament, but the attitude necessary to fight adversity is the same. Lucky we are loaded with top pitching so this doesn't hurt much? Wishing him the best.Sad to see because this spring it looked like he finally might be at the point where we all hoped he would reach when he was traded to the Twins. This is what happens when you continually screw with a young pitchers development cycle by taking him out of the rotation, sticking him in the bullpen for a long period of time then trying to put him back in the rotation. He never should have been taken out in the first place. Front office and Molitor as far as I am concerned. A real shame bc he was looking good this spring, best of luck on the recovery. This is what happens when you continually screw with a young pitchers development cycle by taking him out of the rotation, sticking him in the bullpen for a long period of time then trying to put him back in the rotation. I was going to blame Ryan as a joke, but I respect the effort to do it for real. It's never a good idea to screw with a young arms development cycle. This is one of the effects of doing so. Injuries of course can happen to a pitcher at anytime, but messing with them like the Twins did with May only increases those odds. I had to look at the calendar to make sure this wasn't some sick April Fool's day joke. I was not happy when they pulled him from the rotation before and was very much looking forward to seeing him as a starter this year. Best of luck to him in his rehab. If anything, him throwing fewer pitches the last two years should have helped preserve his elbow. He's been hurt a variety of years in a variety of ways. I don't buy for a second that his development path, even if ill advised for production and roster reasons, had anything extra to do with his injury. We just can't have nice things, can we? I tend to agree. Wonder if Heazy is around and can give us an expert opinion and perspective on this. But I've never seen any kind of correlation in this unless mentally it forced him to do something differently. Difficult to know for sure, so yeah, I do tend to agree. Tough break for Trevor, obviously. He seems the type who will recover and come back okay from this. For now, Berrios and Mejia need to step up and seize the opportunity. I tend to agree. Wonder if Heazy is around and can give us an expert opinion and perspective on this. But I've never seen any kind of correlation in this unless mentally and forced him to do something different. Difficult to know for sure, but yeah, I do tend to agree. What the two pitchers have in common is a career path that is destructive: moving from starter to reliever and back. Over the past decade, teams have ruined a number of pitchers by switching them from one role to the next and seeing the pitchers involved lose health and effectiveness in the process. The jobs have become so completely different -- as relievers' roles are narrowed to throwing 15 pitches 75 times a year -- that pitchers can't port their skills or their training from one to the other without putting themselves at risk. Either way, I think it's clear that there is zero benefit by screwing with the development of young pitchers with upside. Especially with a team like the Twins, who have had terrible SP for a half decade now. It's not like they had 5 aces in the rotation last year and their was zero room for May, a guy who could actually put up a sub 3.50 ERA. There is zero benefit from messing with development of high upside guys like this, hopefully they learn this lesson moving fwd. If the starting rotation starts with Santana, Santiago, Gibson and Hughes, then choose from one of the young guys:Berrios, Duffey or Mejia. I also think, of the last 3 already mention for the rotation, at least one of them should go. I don't really agree with the resigning of both Santiago and Gibson.At some point, you have to move on with youth.